A few years ago, my father-in-law was at my house for a birthday celebration. We were about to dig in to a dessert and he asks, “Is this ‘Daphne sweet’?” He then went on to explain that most of my desserts are just slightly sweet (he went on to explain that it has nothing to do with the sweetness of my character). This Strawberry Tart is light and fluffy, and makes the perfect dessert for any time, especially when strawberries are in season and naturally sweet. And yes, it’s ‘Daphne Sweet,’ also embracing the usual tartness of strawberries. To prepare crust, heat oven to 400F. In a medum-sized bowl, mix the coconut oil, eggs, salt, 1/2 tsp vanilla extract, and honey together. Mix in the coconut flour. Honestly, it works best if you use your hands to massage the flour into the egg mixture, making sure the flour is well mixed. Press the mix into a 9″ spring form pan and bake for 8-10 minutes. On the stove, mix the strawberries and water together, allowing them to cook down making a strawberry sauce. Remove the strawberries, and mix in 1 tsp vanilla extract and lemon oil or juice and stir until well mixed. Add gelatin very slowly, stirring in between each to assure the gelatin is well mixed and does not clump. 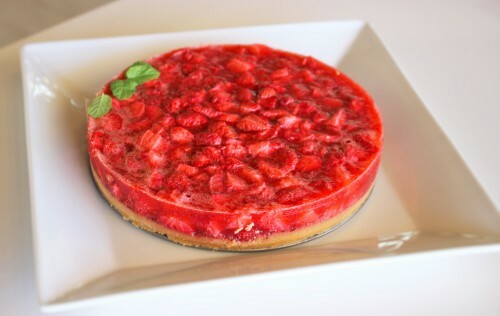 Pour the strawberry mixture over the coconut crust and refrigerate for several hours or until set. This Strawberry Tart pairs well with mint leaves or peppermint tea. How much honey do u put in the crust? The sweetener pie crust can be either coconut sugar or honey. For the honey I use 2-3 tsp to make sure it doesn’t get too soft.